Fiamma Ferragamo believes, as do many designers, that heels are becoming increasingly important each season. But the Ferragamo heels aren't treading the same road as most. "I think that the very heavy chunky look is terrible" she said, using her multi-ringed fingers to express her displeasure. "Extremes are never elegant. 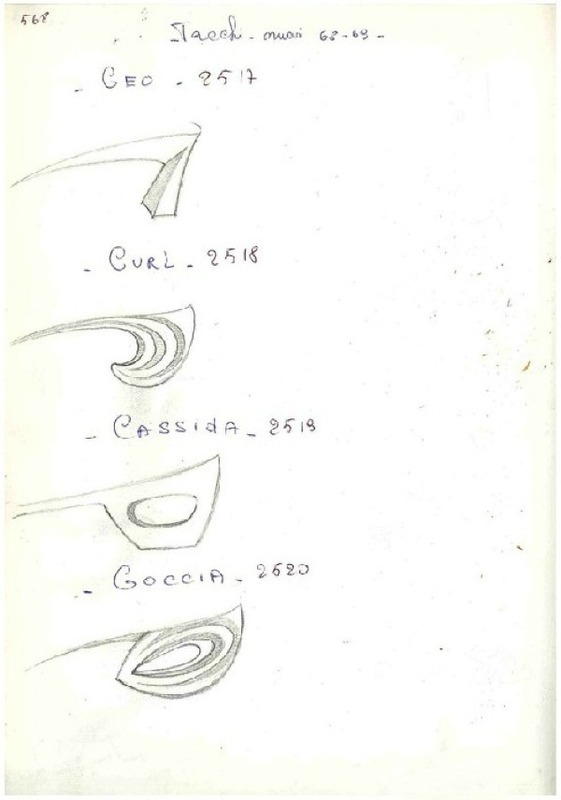 When you exceed a certain limit, things begin to get ugly"
In the picture below - taken from a Ferragamo sketchbook at the the online database Archivi della Moda del Novecento (20th Century Fashion Archive) - the four heels can be identified with both progressive numbers and names: GEO, CURL, CASSIDA and GOCCIA (drop). 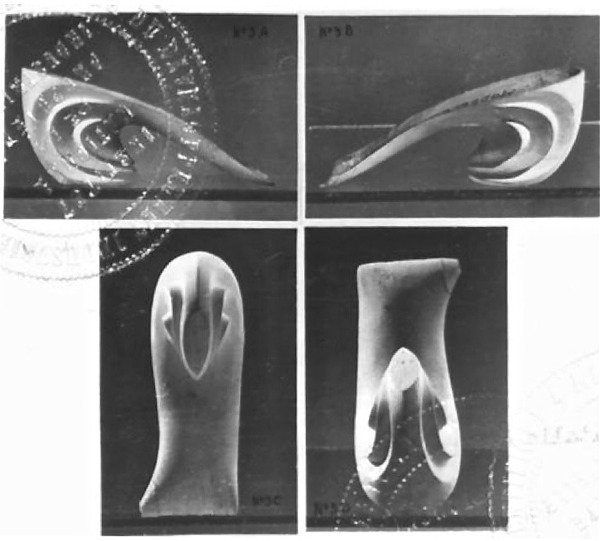 They all have their own entry with pictures of the wooden prototypes taken from the Italian patents. 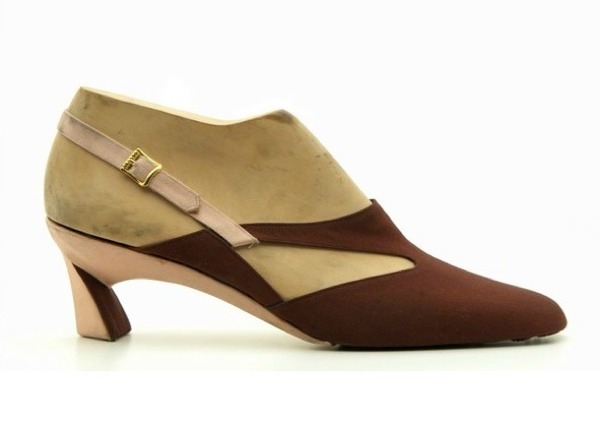 First in line is the GEO; it comes in two slightly different versions (triangular or ogive heel cross section) both patented by IVO BARBARESI and assigned to the company Salvatore Ferragamo S.P.A. As a matter of fact, all the sculptured heels were patented by Barbaresi. Ivo Barbaresi for Salvatore Ferragamo S.P.A. 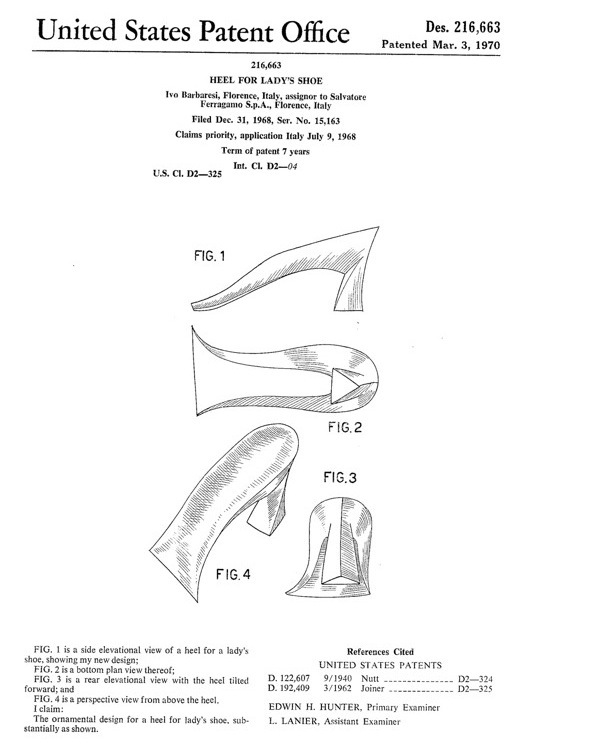 The second model, the CURL, was erroneously considered part of the 1967 Neiman Marcus awarded collection (SCARPE! by Ilaria Daniela and Rosa Chiesa, Rizzoli 2010 - page 96). 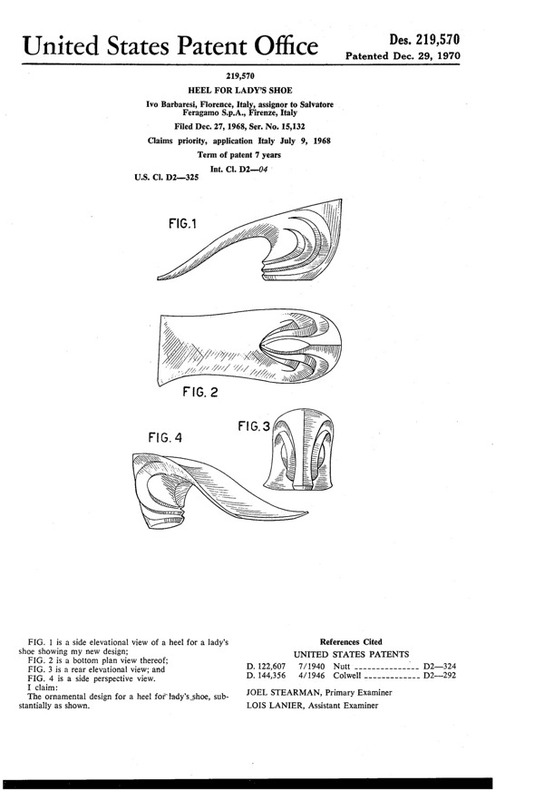 Like the GEO, its first patent was granted in Italy (August 22, 1968), then France (October 17, 1969) and finally U.S.A. (December 29, 1970 but it was filed December 27, 1968!). We already wrote about the fabled CASSIDA, no need to reiterate. It was the one heel who made us start this whole research about clashing dates. 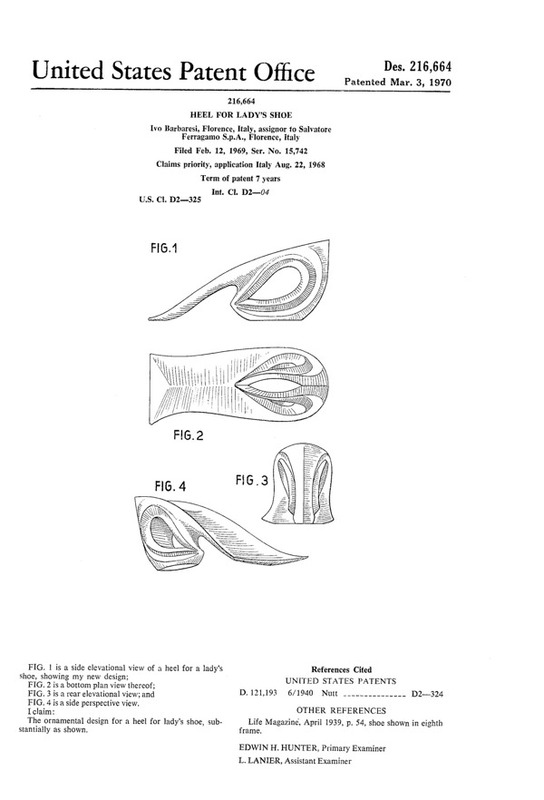 The paper clipping below is stored at Archivi della Moda del Novecento and bear a wrong date (1967). We can say it because the article is basically the same report as the one from the New York Times (retrieved from the NY Times website) complete with heel descriptions, prices and the tagline "exclusively at Saks Fifth Avenue". 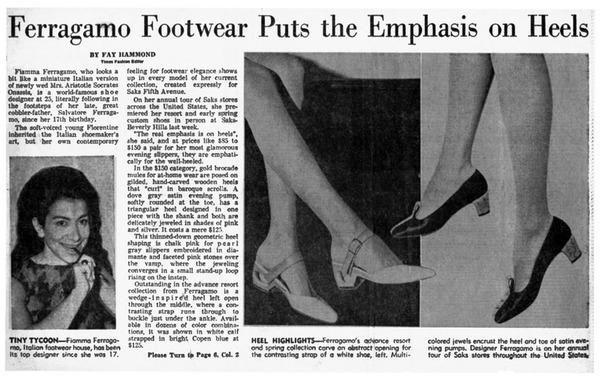 1967 | 1968 | Times U.S.A.
As a side note, the GOCCIA heel patent under OTHER REFERENCES says: "LIFE magazine, April 1939 p. 54 shoe shown in eight frame". This one. 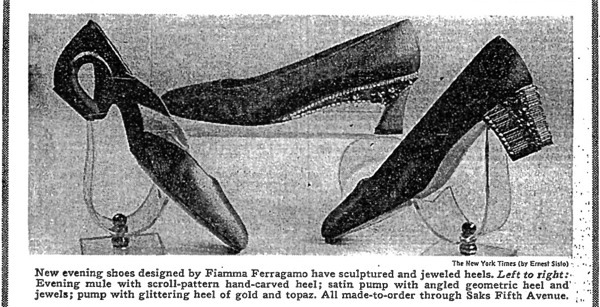 It is, she said (Fiamma Ferragamo), a sculptured wedge. It's just that it goes a little further. 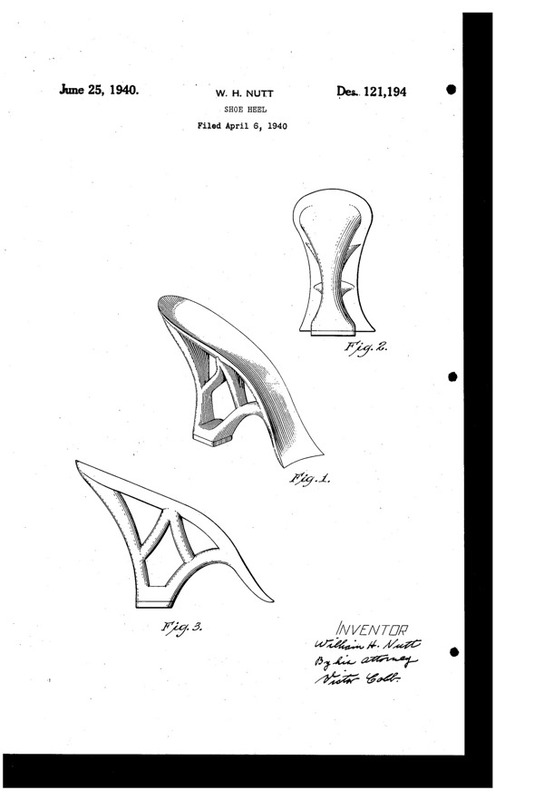 It is a sculptured, scooped-out wedge; and through a doughnut-shaped hole slides a strap that fastens across the instep. 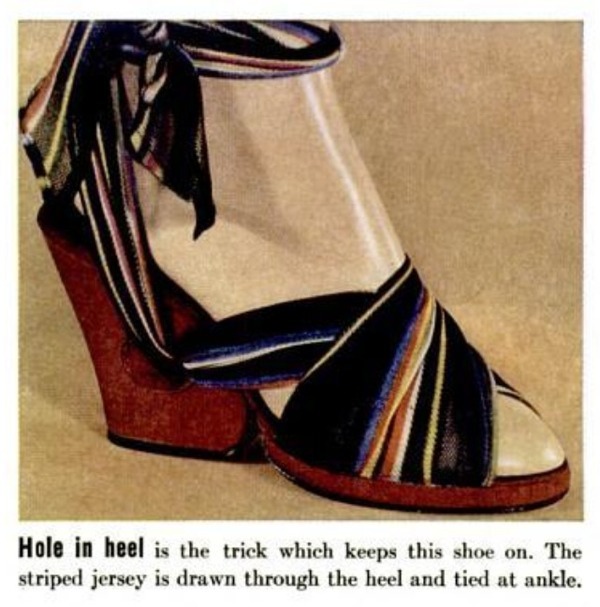 So, we do have here a beautiful, unique collection of heels and we just know - by accident - that the author is IVO BARBARESI. But who is Ivo Barbaresi? Not much on the web but enough to fill the blanks. 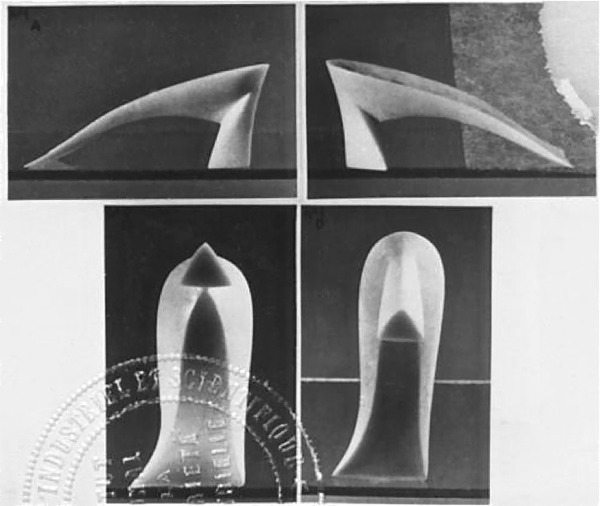 Ivo Barbaresi was born in Jesi (Ancona) in 1915 and died in Florence in 1996. 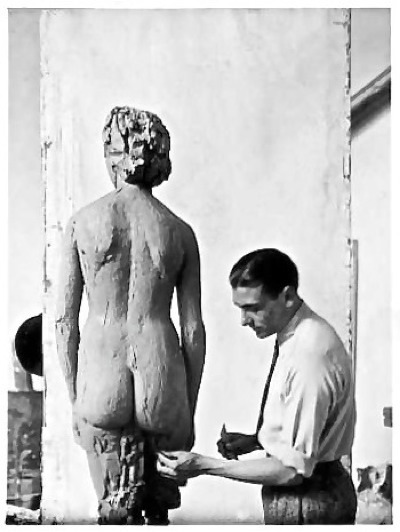 He was a sculptor and a painter, studied at Florence's Fine Arts Academy and spent much of his life in the city. Ivo Barbaresi learned the art of marquetry from his brother Vito. He lived for awhile in London and it appears that his "The Circumcision of Christ" (a Mantegna copy, 1953) is still owned by a British art gallery. 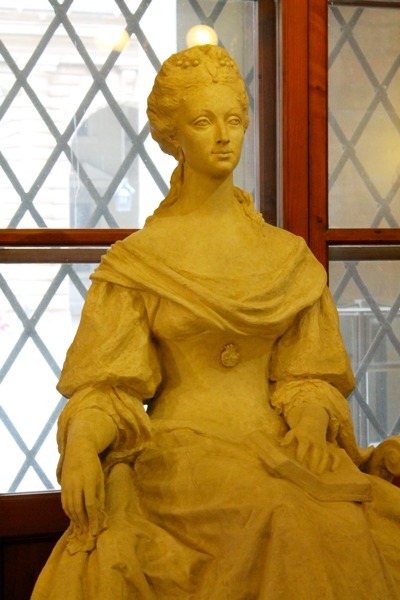 His statue "Elettrice Palatina" (1945) can be seen at Palazzo Pitti since February 2013 donated by Mrs. Fiorenza Bartolotti who got it from the author. 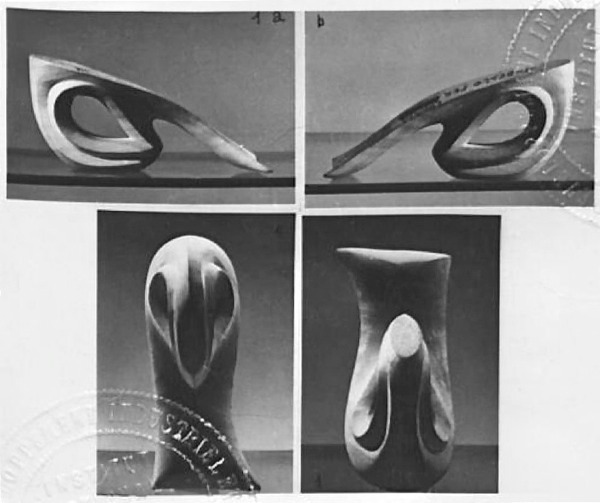 His studio in Piazza Donatello was destroyed by the flood in Florence (1966) and remains unclear how he got the opportunity to work on the set of sculptured heels for Ferragamo. 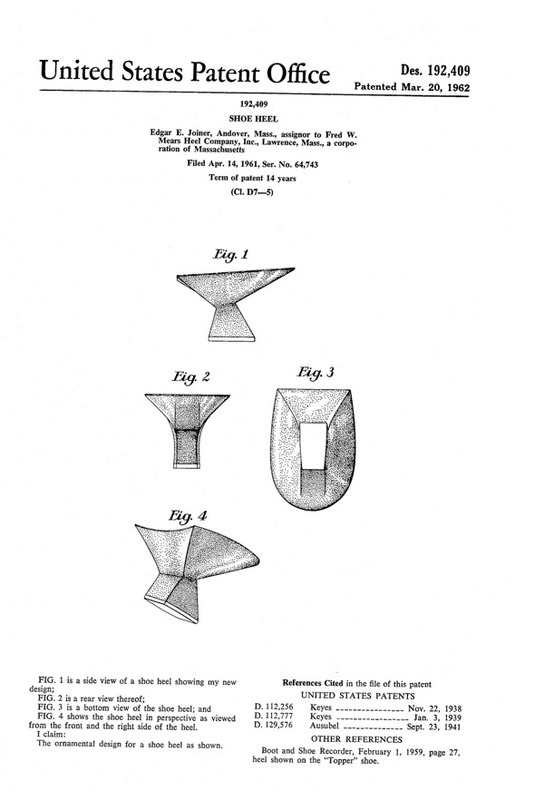 Besides the LIFE picture, the references cited in the Barbaresi's patents deserve to be seen as they help understand where the inspiration came from.